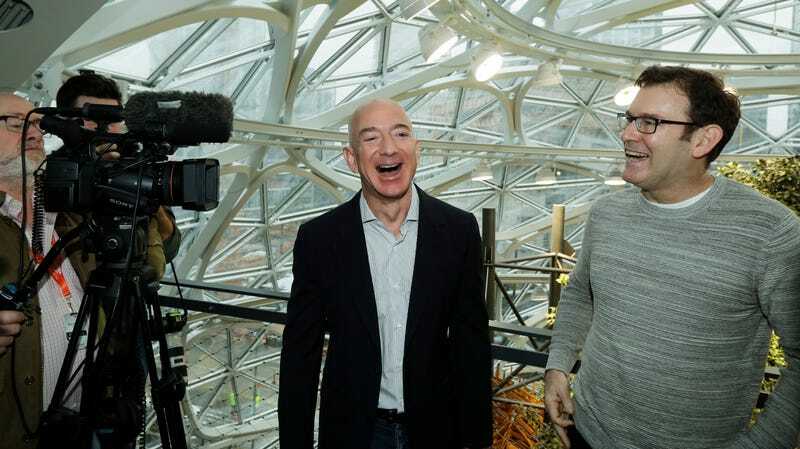 Jeff Bezos, center, the CEO and founder of Amazon.com, laughs as he talks with Ron Gagliardo, right, the lead horticulturist of the Amazon Spheres, following the grand opening ceremony for the plant-filled geodesic domes built for Amazon.com employees. Amazon employees objected to the Trump administration’s “zero-tolerance” policy at the U.S. border, which has resulted in thousands of children being separated from their parents. In May, an investigation by the American Civil Liberties Union revealed that Amazon had heavily marketed its Rekognition software to police departments and government agencies. The technology can recognize and track faces in real time, and the ACLU noted that such a powerful surveillance tool could easily be misused by law enforcement. Earlier this week, several Amazon shareholders called on the company to stop selling Rekognition to the police. That backlash has now spread among employees as well. “Our company should not be in the surveillance business; we should not be in the policing business; we should not be in the business of supporting those who monitor and oppress marginalized populations,” the employee letter states. The Amazon workers’ letter follows employee activism at other major tech firms like Microsoft and Google. Earlier this week, Microsoft employees called on the company to cancel its cloud computing contract with Immigration and Customs Enforcement. CEO Satya Nadella defended Microsoft’s work with ICE, saying that his company merely provided the agency with routine tech services like email, calendar, and messaging. And earlier this month, Google employees saw the success of internal activism against their company’s artificial intelligence contract with the Pentagon—at a staff meeting in June, Google Cloud CEO Diane Greene announced that the company would not renew its contract for Project Maven, a Defense Department pilot program that uses artificial intelligence to analyze drone footage. Google also announced new ethics principles to govern its artificial intelligence work. It’s not clear yet whether the employee campaigns at Amazon and Microsoft will have the same impact as the employee activism at Google—but the pushback at Amazon and Microsoft this week shows that tech employees are increasingly willing to speak up against work that they believe to be unethical. The Amazon letter appears to be the first time an employee demand letter has moved beyond calls to cancel a specific contract to demands to remove a customer from a cloud platform. Although it may seem like a small distinction, it’s an important one for tech companies. Leadership at Microsoft and Google have drawn a distinction between providing benign cloud services to ethically questionable customers and aiding these firms with specific tech that could be used to cause harm. Google, for instance, said that its AI should be used for “socially beneficial” purposes but that it would continue to work with the government for projects like search and rescue or cybersecurity. We have reached out to Amazon and Palantir, and will update when we receive a response.